A few short years ago there was no such thing as a meditation app. Today, there are hundreds. On just one of them — Insight Timer — you can select from 15,000 guided meditations from over 3,000 teachers. Despite all that choice, there are really only about a dozen different things you can focus on when you meditate, and only about two different ways to go about it. Focus on A. When distracted by B, focus on A. ‘A’ in this equation is your ‘anchor’ or meditation object. Typically, your anchor is the breath, but it could also be the body, a sound or mantra, or a visualisation or visual object. Less commonly you might focus on a thought or emotion, a concept or memory, or an idea (like loving-kindness). You could also focus on movement (as in yoga, tai chi or walking meditations), or even pain. Now, if your goal in meditation is to stop thinking, following this instruction might make sense. But why else might we try to ‘anchor’ our attention in this fashion? What purpose does it serve? In other words, what is the role of an anchor? An anchor is used when there’s no one at the helm. For example, when a boat is in harbour, or when everyone on board is fishing. So if we’re using an anchor during meditation does that means that there’s no one at the helm? This, I believe, is a commonly held assumption. We’re led to believe that our minds, or thoughts, are out of control — and that they need to be tethered, anchored, or held in place in some way, lest we drift into dangerous territory. But are our minds really that dangerous? Perhaps if we let them drift we’ll find ourselves pleasantly becalmed? Do we need an anchor when the sea is flat and the weather is fine? Or might we manage perfectly well with the many other tools at our disposal; the rudder, the keel, the sails and sheets, the wheel itself. Can we not steer, and even right ourselves, without dropping anchor? And what if we don’t want to sit in one place? What if we want to explore? What if the fishing is better further out from shore? I’d like to suggest that the first thing you do in meditation is weigh anchor. You’ve probably spent enough time focusing during your working day. It’s time to go sailing! You can trust the wind. You have a compass. You can navigate your way easily through a few waves. You can notice the changing weather conditions and currents. And you can adjust your course using the rudder and sails. Doesn’t this sound more interesting than sitting in the harbour? You can get out and see the world. There are places to visit and discoveries to be made. Deserted islands. Hidden treasures. Reefs teeming with fish. Dolphins cavorting. If there’s foul weather brewing you may seek shelter in a bay. And should you run afoul of pirates, well, even then you might prefer to run on the breeze rather than drop anchor. Of course, this doesn’t mean that you can’t use your anchor, when circumstances call for it, or even out of simple curiosity. An anchor does have it’s uses. If you’re sailing in treacherous waters, or too close to the rocks, in unvafourable winds, then it might be wise to drop anchor. 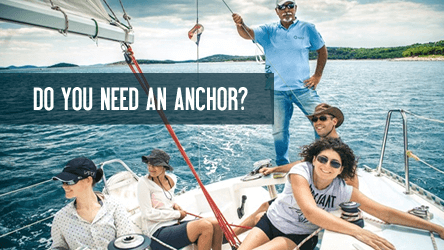 If you’ve been sailing all day and find yourself in a lovely sheltered bay, again, you might decide to drop anchor and rest in place for a while. And if you are way out to sea, beyond the sight of land in any direction, unsure of where you are or whether you are drifting south, again, you may choose to rely upon an anchor. Do you use an anchor when you meditate? If so, do you use it all the time, or just when you feel like it’s required? Does the idea of sailing through your mind scare or excite you? Let me know in the comments below. I’d love to hear your thoughts. And if you’d like to try out an anchor-free meditation, give this meditation on finding your focus, or this one on finding your meditation mojo are both good places to start. Interested in how you might set sail in your meditation practice? Thanks so much for your appreciative comments Majella. They mean a lot. Such a well written and helpful article Matt, well done! I love the mindset of being able to choose how you want to sail your boat ( your mind ). I personally enjoy sailing when it comes to meditation rather than throwing down the anchor in fear of the unknown. Thanks for your kind words Camille. Happy Sailing! Did not know you are a sailor, too! Beautiful writing and thoughts, thanks, seriously!! Thanks Minnie. Truth be told, I sail better when I’m sitting on a meditation cushion. You’re very welcome Kirsty. And yes, focusing on the breath has its benefits; but it can become very limiting if it’s your only option.